Got a dated office? A 1980s sort, filled with cubicles that hide your crew from the clients they serve? Open that office up and put in some additions that will raise the enthusiasm level of your employees to staggering heights. Get started on an office remodeling for your Maple Grove area business by calling on Titus Contracting. Update your space, reinvigorate your workers and dazzle your customers with an office remodeling! Gain new office space that is perfectly set-up for you. Titus Contracting stays both on time and on budget throughout the whole process. If you are looking for a complete revamp or a few touches in the form of new cabinets, stylish and functional countertops, doors, entryways, flooring, lighting fixtures, painting, trim, or wallpaper—Titus Contracting can bring that to life for your business within mere months! As business owners ourselves, we know how important it is that your office remodeling project does not disturb the daily functionality of your company. We also know that it is paramount that your office looks as good as possible. We know that after all, a first impression can make or break a deal! Your new office will help bring in new clients; we make sure you have a more pleasant atmosphere for your workers to conduct business in. Not many businesses can afford to shut their doors and allow for the loss of business while a Twin Cities full-blown office remodeling is being conducted. It is absolutely necessary to hire an experienced construction project management company to keep your business running. When Titus Contracting runs your office remodeling project, rest assured you’ll get high-quality work with minimal disruption. 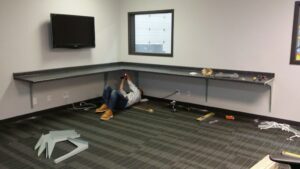 Our office remodeling teams work efficiently, never sacrificing quality. Throughout the entire office remodeling process, you will be kept fully informed of all aspects of the status of the project. Call us any time there are questions or concerns. Browse our galleries to take a look at some of the high-quality work we have completed. Call today; we’ll schedule a consultation and tell you more about our office remodeling services!! Are you interested in getting more information about office remodeling in Maple Grove or the surrounding areas? Call us at Titus Contracting at 952-746-7817, or you can contact us to schedule a consultation.